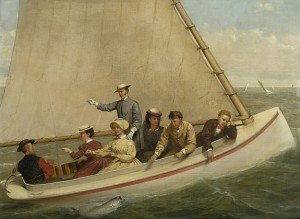 “The Coast & the Sea: Marine and Maritime Art in America,” currently on exhibit at the Portland Museum of Art, is a must-see for history buffs, sea aficionados, art lovers or those who are just curious to learn more about how Maine maritime history helped shape the growth of the United States. A relatively young country, the narrative of the United States still continues to be written and its future re-imagined with each new generation. Since its founding, the “story” of the United States has largely centered around ideas of optimism, hard work, and promise, and the notion that this ideology came from an era when the country was inextricably tied to the sea is no coincidence. Throughout history, the sea has represented humanity’s spirit of hope and possibility, with the simultaneous potential for danger and ruin. In the context of a hard fought for and newly established nation, the sea represented both of these realities while framing a collective vision for the people of the United States of America. 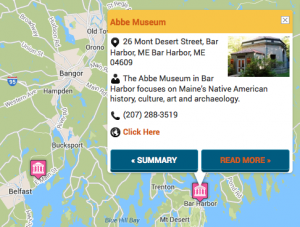 Those who live on the coast of Maine understand that proximity to the ocean and waterfronts can have quite an impact on one’s identity and on our perceptions and understanding of the world. During the age of sail, tall ships dominated the seas—among other things, they transported supplies and furnishings; brought immigrants to a new land; and served as war vessels. “The Coast & the Sea: Marine and Maritime Art in America” does a superb job in framing the narrative of the subject, allowing visitors to reflect on how Maine and other American seaboard states played a significant role in shaping the economic growth of rest of the country. The paintings, largely done between 1750 and 1904, cover a wide swath of America’s adolescence and are significant in that the works themselves helped create the American Dream by representing an array of possibilities of the future for the country. In addition to the paintings—which include coastal landscapes, naval battles, portraiture, and much more—”The Coast & the Sea” also contains other rare maritime artifacts including navigational equipment; awards given for wartime bravery; and intricately carved scrimshaws. Through this exhibit, the events and stories of the era woven with the strong maritime thread are brought to life. In addition to this current exhibit, the museum also has multiple galleries devoted to artists’ representations of the Maine coast, including Winslow Homer’s maritime masterpiece Weatherbeaten. 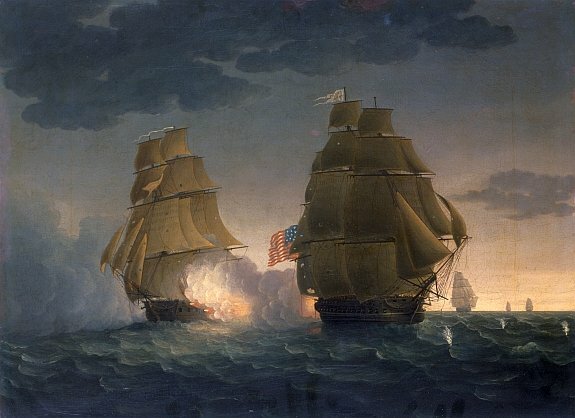 “The Coast & the Sea: Marine and Maritime Art” in America runs through April 26, 2015. Founded in 1882 under the name of the Portland Society of Art, the Portland Museum of Art (PMA) is the oldest art institution in Maine. PMA is comprised of three buildings: the museum itself with various galleries and a cafe; a three-story, immaculately preserved Federal-style mansion built in 1801 owned by shipping magnate Hugh McLellan; and Winslow Homer’s newly restored studio at Prouts Neck, a source of inspiration for the artist and where he often painted his seascapes.